The encoding problem caused by the hack still isn’t fixed. This means that Chinese characters and Pinyin with tone marks still don’t appear properly on this blog (but they’re fine on pages in the rest of Pinyin.info). But, still, there are some things I’d like to let people know about, including an important announcement coming up soon. So I’m going to start posting some things, even though that means no Hanzi or tonal Pinyin for at least the near future. (Don’t forget: That means Hanzi won’t work in your comments here.) Fortunately, most of the time Pinyin doesn’t really need tone marks. Without Hanzi and tone marks it’s more difficult to write about Chinese characters and Pinyin, which are, er, only the main topics of the site. But I’ll do what I can. Anyway, why let Victor Mair have all the fun? So until the encoding issue is resolved y’all can expect a relatively large number of posts catching up on Pinyin-friendly fonts, a few posts covering news and announcements, and probably at least a little of the bile that you’ve come to expect from this site — unless, of course, during the years I’ve let this blog go fallow public signage has all been fixed, the authorities are finally using Pinyin correctly, and people who ought to know better have stopped spouting complete nonsense about Chinese characters. Heh. We’ll see. 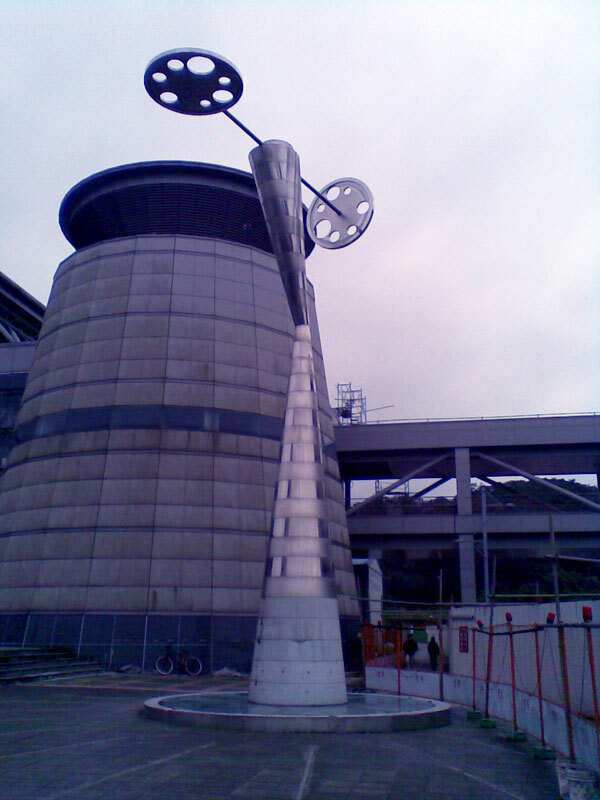 Here are some photos of a large, elaborate, and no-doubt expensive sundial outside the Nangang high-speed rail station (next door to the Nangang train station and Nangang MRT station). These were taken at 11 a.m. (The one of the sundial itself was taken on a different day.) 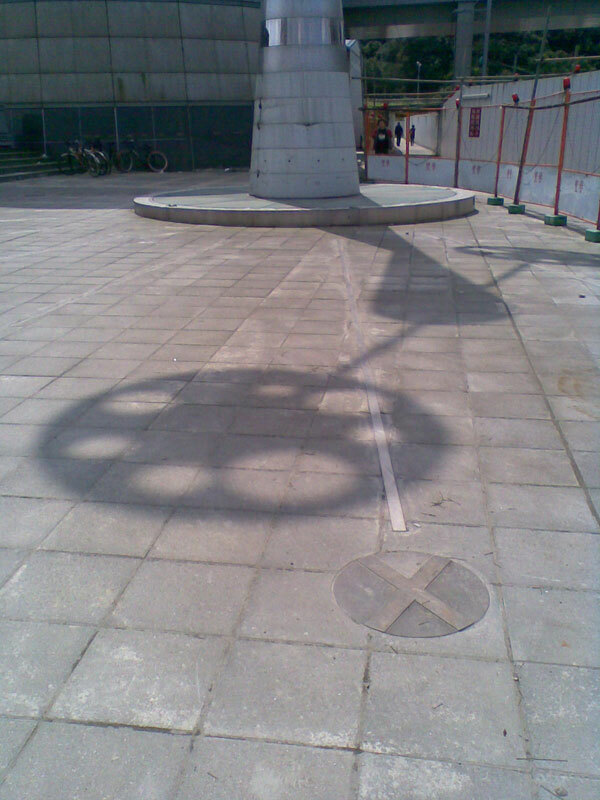 But as you can see below, the sundial certainly isn’t indicating the time is 11:00. Rather, it’s pointing toward 9:20 or so. 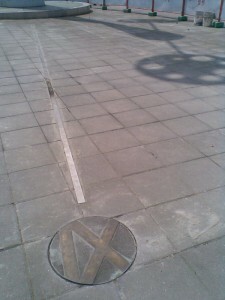 The disc labeled IX is actually XI (11). I took the photo from a reverse vantage point, so the number is upside down in the photo. 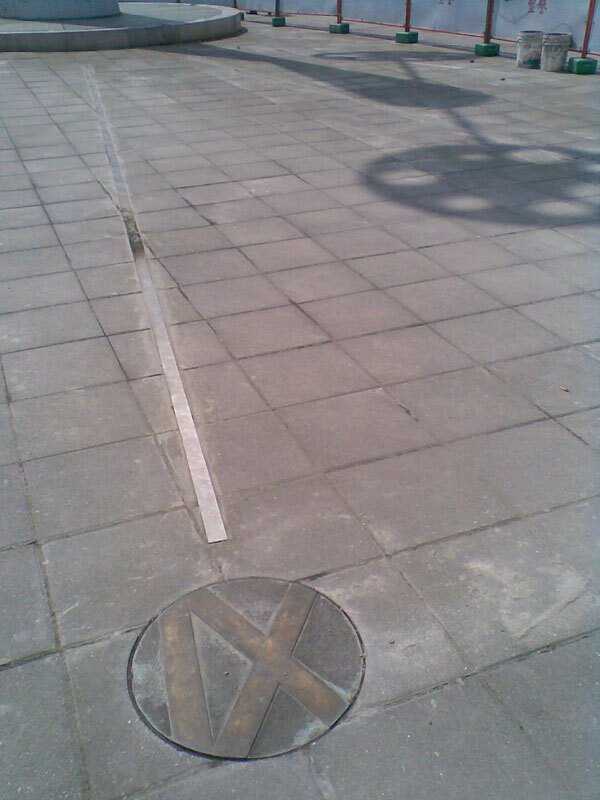 Perhaps whoever erected the main part of the sundial doesn’t know Roman numerals. (Sorry: that’s about as close as this post gets to talking about scripts.) But that wouldn’t account for the dial indicating 9:20 instead of 9:00. 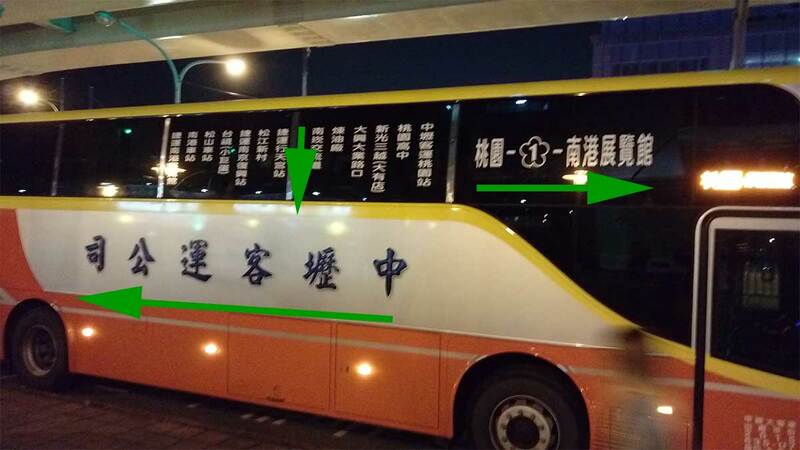 I contacted the Taipei City Government about this. They said to contact the Taiwan High Speed Rail Corporation, which I did. They, in turn, responded that I’d reached the wrong office and should write a different office; but they didn’t forward the message or provide me with the correct e-mail address. Once I’d tracked down another office I e-mailed the folk there. That was more than a week ago. There has been no response. I spoke with someone at the site who appeared to be in a position of authority. He told me that the sundial hadn’t been adjusted yet and that they would get to it next year. He was too busy to answer any more questions though, such as “Next year?” Also, I suspect that it won’t be easy to rotate that huge thingamajig, so why didn’t they get it right the first time? Still, at least someone in authority seems to understand there’s a problem. *For anyone who doesn’t recognize the title of this post, it’s an allusion to the 2001 movie Nǐ nèibiān jǐ diǎn (《你那边几点》 / What Time Is It There?). syz of Beijing Sounds has been about as busy this month as I have been useless. 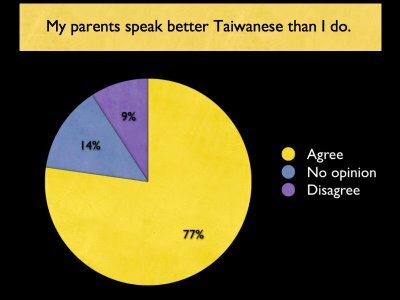 Johan of Talking Taiwanese has more of his well-researched and generally depressing findings (though it’s not all bad news): Taiwan’s Urban Language Shift. Koh Lay Chin of Malaysia’s New Straits Times examines the controversy over the language(s) of instruction for elementary school science and math in It’s not exact science in choosing English. Professor Qián Nǎiróng (Qian Nairong / 錢乃榮) of Shanghai University has just issued free software to help with the writing of Shanghainese (上海话). People may now download the 1.3 MB zip file of the program. Xiànzài, wǒmen zài wǎngluò zhōng liáotiān de shíhou yuèláiyuè duō de péngyou dōu kāishǐ xǐhuan yòng Shànghǎihuà. Dànshì yǒushíhou shìbushì juéde xiǎng biǎodá dehuà bùzhīdào zěnme dǎ, nòng de yǒudiǎn bùlúnbùlèi ne? Xiànzài, yī ge kěyǐ qīngsōng dǎchū Shànghǎihuà de chéngxù chūlai le. Háishi tóngyàng 26 ge zìmǔ de jiànpán, 8 yuè 1 rì qǐ xiàzài le Shànghǎihuà shūrùfǎ zhīhòu, nín jiù kěyǐ tōngguò shūrù “linfhakqin” dǎchū “līn wù qīng,” shūrù “dhaojiangwhu” dǎchū “táo jiànghu” děng yuánzhī yuán wèi de Shànghǎihuà le. Zuótiān, jìzhě tíqián xiàzài dào gāi ruǎnjiàn. Ànzhào shǐyòng shuōmíng, yòng quánpīn de fāngshì chángshì shūrù “laoselaosy” zhèxiē zìmǔ, píngmù shàng, lìjí chūxiàn le “lǎo sānlǎo sì” (Shànghǎihuà, yìsi shì “màilǎo, chōng lǎochéng de yàngzi”). Jùxī, yóuyú Shànghǎihuà yǔ Pǔtōnghuà de dúfǎ yǒusuǒbùtóng, suǒyǐ zài pīnyīn pīnxiě fāngshì shàng háishi xūyào shǐyòng shuōmíng de bāngzhù. Bǐrú jìzhě fāxiàn, fánshì yǔ Pǔtōnghuà shēngmǔ, yùnmǔ xiāngtóng de zì, zài Shànghǎihuà shūrùfǎ zhōng zuìzhōng yòng de háishi Pǔtōnghuà pīnyīn, bùtóng de zé cǎiyòng Shànghǎihuà shūrùfǎ de pīnxiě fāngshì. Rú “chénguāng” de “chén,” “huātou” de “tóu” dōu fāchéng zhuóyīn, Shànghǎihuà pīnyīn shūrùfǎ zhōng yàozài shēngmǔ zhōng jiā yī ge zìmǔ h, pīnchéng “shen,” “dhou;” fánshì rùshēng zì, zé zài pīnyīn hòu jiā zìmǔk, rú “báixiāng” de “bái” jiù pīnchéng bhek. Bùguò, dàjiā bùyào juéde tài nán. Jìzhě fāxiàn, Shànghǎihuà shūrùfǎ yǔ Pǔtōnghuà de shūrùfǎ zuìdà xiāngtóng zhī chǔzài yú, zhǐyào liánxù shūrù shēngmǔ hé yùnmǔ jiù kěyǐ, bùxū shūrù shēngdiào. 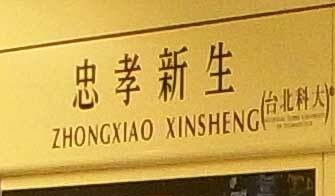 Cǐwài, Shànghǎihuà pīnyīn shūrù xìtǒng háiyǒu lèisì “zhìnéng” yōudiǎn, kěyòng suōlüè fāngshì bǎ cíyǔ pīnxiě chūlai. Zhǔchí Shànghǎihuà shūrùfǎ kāifā de Shànghǎi dàxué Zhōngwénxì Qián Nǎiróng jiàoshòu gàosu jìzhě, zhè tào shūrùfǎ bùjǐn néng dǎchū Shànghǎihuà dà cídiǎn zhōng 15,000 duō ge cítiáo, érqiě hái néng yòng Shànghǎihuà pīnyīn dǎchū Shànghǎihuà zhōng shǐyòng zhe de, yǔ Pǔtōnghuà cíyì xiāngtóng dàn yǔyīn bùtóng de chángyòng cíyǔ. Rú “Huángpǔ Jiāng” shūrù “whangpugang” , “lǐxiǎng” zéshì lixiang děng, gòngjì 10,000 duō ge cítiáo.